In 1948 the Democratic Party didnot stand united behind a single candidate. Truman, the incumbent, proposed several progressive reforms which committed the Democratic party to formulate a platform of explicit racial equality with “the end of state poll taxes, anti-lynching laws and the desegregation of the military.” These proposals led to revolts by Southern representatives. In response to the moves toward racial equality, many disgruntled southerners left the Democratic Party to form the States Rights Party. In the long run the Democratic Party was able to maintain enough support to get Truman re-elected. 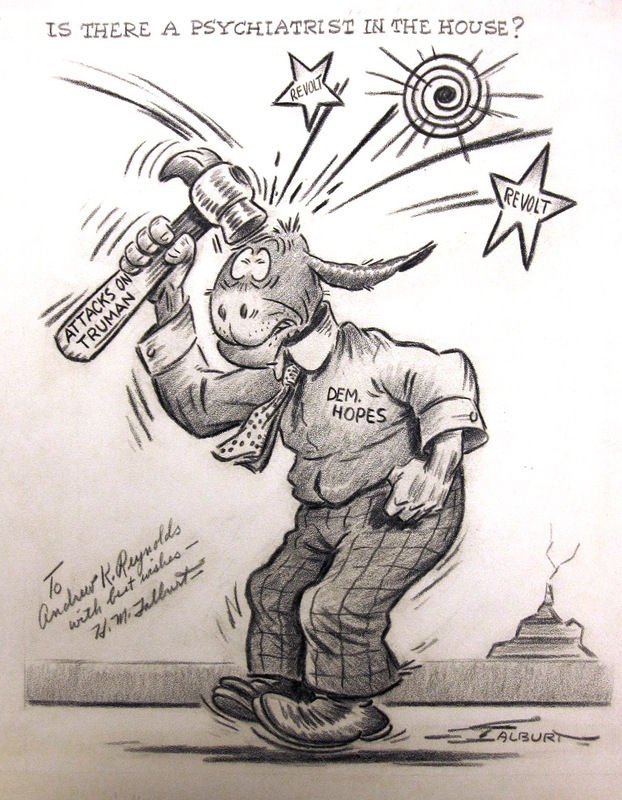 H.M. Talburt, “Is There A Psychiatrist in the House,” James Monroe Museum Political Cartoons, accessed April 19, 2019, http://jmpolitoons.umwhistory.org/items/show/117.